Pentagon Education Services Blog > Study Abroad > What are the myths about studying medical abroad? Are you aware of the various myths about studying medical abroad? Often ambitious students who are willing to come out of their comfort zone are eager to take up medical studies abroad. And, of course, going overseas for higher education opens up global opportunities for the prospects. But with so many myths about studying medical abroad, it becomes quite a daunting task. So, to help you take up the right career orientation of forming a global career, here are the most popular myths busted to soothe you. Studying medical abroad is expensive: Of course, looking at the whole set of expenses including the tuition fee, the books, the overhead expenses, renting accommodation, etc. can cost you heavily on your pocket, but, there are numerous ways to fund your studies abroad. The most convenient way of funding your medical education is to score well in international entrance exams such as GRE, TOEFL, and IELTS. Alternatively, you can finance your studies with educational loans, and for the rest of the expenses you can find an 0n-campus part-time job, research assistance job or teaching assistant job. This will support your living expenses to a great extent. Moreover, the jobs provided soon after studies are very well-paying in foreign countries. Fortunately !with a fat pay cheque every month, you end up clearing all your debts in merely 18 to 24 months. This is one of the reasons why many students still study abroad even when their financial family background doesn’t support it. They take educational loans for medical education and repay them quickly soon after getting a job. Homesickness: Another fear that most students carry in their heart regarding seeking medical admission is the fear of getting homesick. Most students move the fear of being lonely while studying in the US. It takes about a year surely to get settled in a foreign land. You need to involve yourself in a lot of extracurricular activities to stay away from homesickness. There are plenty of things to do in western countries like hiking, trekking, cycling, camping, pot luck, swimming, etc. Such activities help you to socialize and form friends quickly which help you to settle down faster in a foreign land. Of course, in the first two years visiting family back home might be a little challenging due to expensive flight fares and massive study pressures. But, with all the hustle and bustle happening over the weekends, you will get acclimatized to the different weather and culture soon. Living abroad is a lot of fun is another popular myth of studying medical abroad. Of course, it is but when you are financially well-settled and love the job you do. Usually, during the initial years of your staying abroad as a student, you are bombarded with a lot of things to do. You have to manage your studies, cooking, household chores, grocery shopping and take care of your health in an entirely changed weather and food culture. So, the initial few years are a bit more struggling, but in the end you do start enjoying living overseas for the kind of exposure you get. If you are not much of a cook, then homesickness does seep in longer making you long for home-cooked food. But! If you have to gauge living abroad, then it is a mix of massive hard work coupled with fun and excitement. Foreign medical education is much valued by Asians per se. But grabbing a foreign degree doesn’t end the career struggle. When it comes to grabbing a good job, you surely have won the battle with the tag of an international brand, but, you have to continually evolve and upgrade yourself to be accepted by the industry. Working overseas also involves a lot of hard work and dedication, and you have to give honest continuous inputs to perform well. 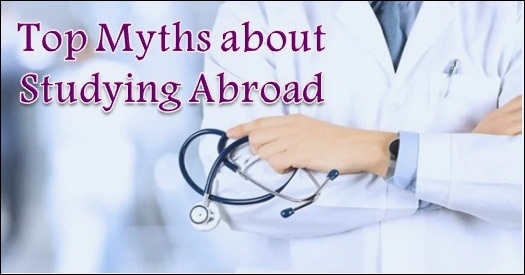 These were the popular myths that have existed for a long time about studying medical abroad. Hopefully, busting these myths about studying medical abroad serve as eye-openers for you and you are able to place the right bets based on the realities and not on myths. Looking for Medical Abroad Admission Guidance and Support? Contact Us!